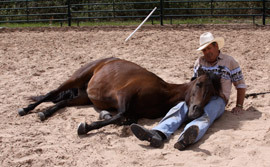 Mr. Tim Manson, President and founder of Innovative Horizons, is a corporate trainer as well as an avid horseman, with over twenty-four years of experience in the field of adult training and over 30 years of experience working with horses. With this background, Tim naturally evolved from the classroom environment to the experiential environment, using horses in his corporate training programs. Tim works with organizations dedicated to maximizing their organizational effectiveness by enhancing the efficiency of their employees. Tim teams up with his clients to create a culture of Performance, Accountability and Service in today's competitive marketplace. He is an experienced leader, educator and consultant in the corporate world, as well as the Department of Defense. Tim holds a Bachelor's degree from the University of Missouri, Columbia. He is a Certified Training and Development Specialist and has researched and developed numerous extensive training manuals for organizations in the United States as well as for the Kingdom of Saudi Arabia. In his 101/2 years as a United States Army officer, he conducted numerous training programs for soldiers and trainers of all ranks, as well as evaluating training programs and supervising military trainers. Since leaving the military, Tim has provided training expertise in both the U.S. and internationally. He has conducted numerous training programs for clients such as the United States Army, the Saudi Arabia National Guard, the Student Loan Marketing Association, the Texas Guaranteed Student Loan Corporation, the Vinnell Corporation, EER Systems Inc., the Computer Sciences Corporation and Laboratory Tops Inc.
Tim also offers motivational and humorous keynote presentations as well as breakout sessions for organizational conferences, luncheons and banquets, with topics such as "Listentication: The art of hearing what is said, and seeing what is heard" and "The Power of Perception--How our perceptions shape or misshape us." Tim is an active leader in Toastmasters International and is a member of the American Society for Training and Development. Tim Manson is a professional speaker and trainer who motivates, educates, entertains, and strives to make a difference in his students' professional and personal lives.